As many of our neighbors in Saratoga noted, we didn’t have a Spring: it went straight from Winter into Summer. From piles of snow to insufferable heat. Such is life in the post-industrial age, right? So it’s officially Summer, for those who keep track. And, precisely because the season sort-of slid into home plate, too many of us neglected to make plans for anything that even resembles Summer vacation. Unfortunately, that leaves us with “Stay-cations,” as it’s come to be known. And, really–you know how that translates: You envision yourself chillin’ on your back porch, sipping Mojitos. But really, you’re mowing the lawn. * Cleaning the gutters. Again. * Planning a drive to Vermont–but never actually doing it. Because you’re tired. * Assembling your family’s Emergency Preparedness Kit and dry rations–for the inevitable Zombie Apocalypse. (FYI: It’s not going to happen. So what you end up with is just another three months of working, working–then, “Stay-cationing” at home, where–you work. And before you know it–it’s Thanksgiving. And you’re still tired. You love Saratoga. It’s one of your favorite places on Earth. Or you’ve dream’t of Saratoga–and you can think of nothing sweeter than chillin’ in our outstanding little city for a couple of days. But it’s the end of June–so, no dice, right? Surely, the closest to Saratoga that you could get a room would, be, what–Montreal? Wrong. If you think of coming to Saratoga for a week, yes, that might be nearly-impossible this far into the Summer. Actually take time off. Even a couple of days. You didn’t get your vacation request in on time to actually go anywhere other than Big Y, but that doesn’t mean you can’t get a day, two–even three-off during the summer. Just to get away. And where better than Saratoga? Where, more restful, than at our legendary inn for a couple of nights? Just to sleep, in a beautiful, peaceful, quiet environment. To sit on a beautiful, historic porch on one of the loveliest boulevards in all America: Union Avenue in Saratoga Springs, New York. You didn’t make vacation a priority because Mother Nature pulled a fast one on you, and, BAM, Summer is here, now. But Mother Nature also gave you a keen sense of self-preservation: You know that you need and deserve a rest. Take a day, a night–a couple–two/three days and nights. Call us now, with your calendar in-hand. We’ll have our calendar in-hand, as well. We’ll work with you to give you the rest, the quiet–and the Chef-prepared, gourmet breakfasts the next mornings(s)–that you so richly deserve. Schlaf gut, then Bon Appetit at The Brunswick at Saratoga Bed & Breakfast. We’re eager to meet you, and help you rest, chill, and dine like royalty–then, prop you up, prepared to go back home, thence, to work. And to your Stay-cational lawn-mowing. Posted in Brunswick Bed and Breakfast | Comments Off on Summer’s Here, and the Time is Right to…Give Yourself a Break. Just when you thought that you had a few days not to leave the house. No reason to trek to Saratoga–to stay home, catch up on cleaning those gutters and mending the broken spindle on the porch rail–you find yourself drawn once again. Once again, to The City in the Country. Once again, to delightful, delicious, delectable Saratoga Springs, New York. 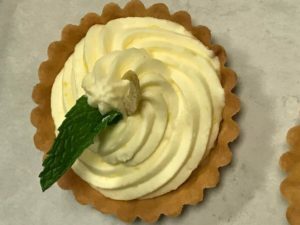 Once again, the siren song you hear in reality is your olfactory glands pinging all over the place, as you smell foods and bevs from so many dining and drinking establishments, wafting their ways into your nose, thence into your very being. Yes, folks, it’s time again for Eat, Drink, Saratoga. Along with the gustatorial delights that will throw themselves at you on June 30, 2018, will come the sure knowledge that, oh, you really should have thought about the fact that you just don’t feel like driving home when ’tis all said, done and devoured. That’s why we’re here. We sit quietly on Union Avenue in Saratoga, waiting to usher you in on the night of June 30th. After your long day and evening of indulging your dining senses, we’ll be here. The (Chef-Owned-and-Operated) Brunswick at Saratoga Bed & Breakfast. We know that you had a great time, and we want to give you your Best.Night’s.Sleep.Ever. at the end of your dining journey. Then–after you’ve rested deeply in one of our exquisitely-comfortable beds–slept, like a well-fed baby bear–the scent of Chef Kate’s own breakfast offerings will lure you downstairs the next morn. Sure, you ate, and you ate royally, around town. But that was last night, and this is today. 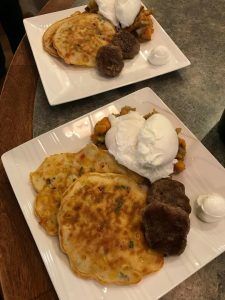 And today–July 1– the day after Eat, Drink, Saratoga–today is the day when you can pull up a chair, and consume cuisine breakfast such as is found nowhere else in our glorious city. Chef Kate will take care of you–and give you the fuel of both body and soul that you need to make that long (or, short) journey, Home. Home. 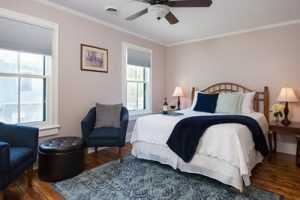 Where you’ll actually dream about your dreams at The Brunswick at Saratoga Bed & Breakfast–and of that incomparable breakfast, Chef Kate’s nectars of the gods. You’ll promise yourself to return. And you will. To reserve your room, your bed and your otherworldly breakfast for that night, call us and reserve, now: (518) 584-6751. Posted in Brunswick Bed and Breakfast | Comments Off on Eat, Drink: Saratoga. Then, Sleep, Eat Again: The Brunswick AT Saratoga B&B. We at The Brunswick at Saratoga Bed & Breakfast took a few minutes off on May 16th to trek down Route 50 to Schenectady. The occasion? 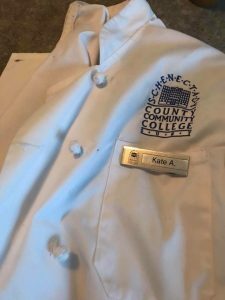 The graduation of our own Kate Amello from the Culinary Arts program at Schenectady County Community College. Quickly, she became enamored with the program, and made the decision to continue pat-time ’til 2016, when The Brunswick became Kate’s reality. 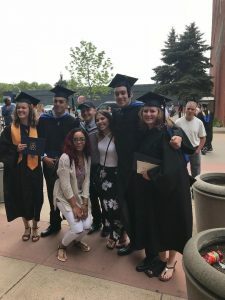 Kate is not one to walk away from opportunity or challenges when they present themselves…so she went straight to work as owner of The Brunswick, while taking courses at SCCC. 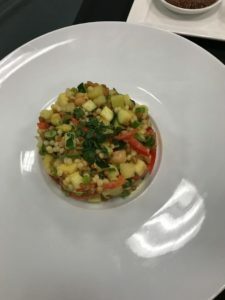 In the Autumn of 2017, she became a full-time student (while seamlessly running this place)—because that designation, Chef, loomed before her and she was eager to receive the reward that comes from all her hard, focused work. During her tenure at the College, Chef Payne (her Culinary Instructor for Food Prep I, II and Dining Room), suggested to her that—if she was truly interested in owning a B&B one day—she should apply for the job, Assistant Innkeeper at the stately, well-established Batcheller Mansion Inn in Saratoga Springs. She interviewed and was hired that very day. 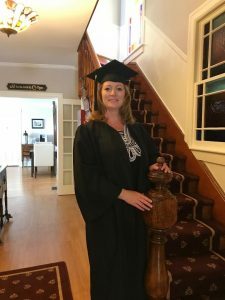 After several months in the position, she was promoted to Innkeeper. Kate effuses that she learned so much during her time at the Batcheller, an experience for which she is eternally grateful. Kate had a dream. She shared her vision with her family, who saw the passion in her eyes, and heard it in her voice. She gave it her all in school, and applied everything she was learning as she took the reins of The Brunswick two years ago. 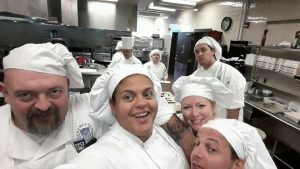 Her instructors, chefs and fellow students at SCCC (like, The Four Pack)–spiced her journey with their friendship, insights and encouragement. 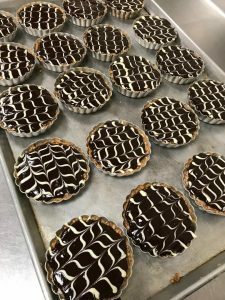 With the strong support of such a network of good hearts, it’s no wonder that Kate Amello today is one of the precious few Chef/Owners of an historic Bed & Breakfast in the most hospitable city on Earth—Saratoga Springs. Thanks for bringing us all on your journey, Kate!